Guess what happens when you make fun of Urijah's cornrows? 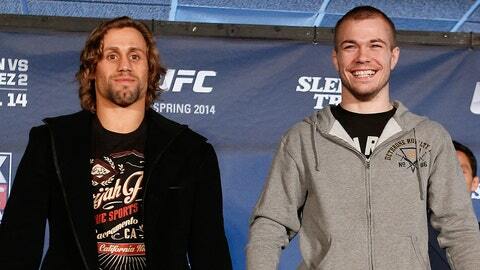 Yeah, Urijah Faber got the last laugh. But there’s no doubt Michael McDonald got in the first jab. Except it wasn’t public until now. A UFC staffer sent a text to a handful of fighters Saturday night before UFC on FOX, telling them to meet at 2 p.m. for transportation from the event hotel to Sleep Train Arena in Sacramento. Faber responded that he was still getting his hair done, sending a picture of his meticulous cornrows being put in. McDonald responded with a similar picture with his shirtless brother hovering over him, with his hands on McDonald’s nearly shaved head. Chad Mendes absolutely loved it, typing "haha" until his fingers likely started to bleed. It was more damage than he took later in the day against Nik Lentz.